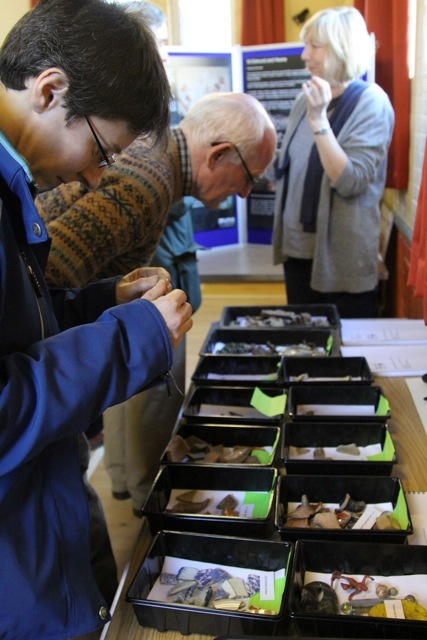 We now have a display case in the Swan pub restaurant containing some of the artefacts found here during our dig last year. 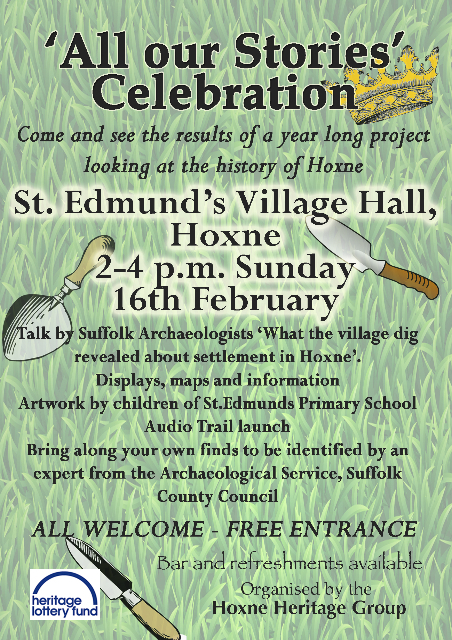 When the building work in the church is completed there will be a further display here of our finds in Hoxne. 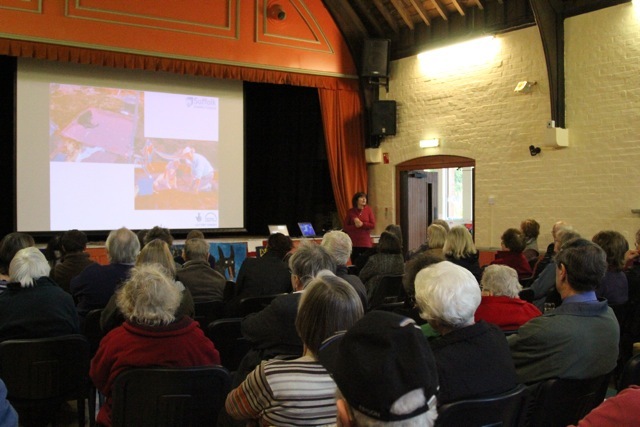 The Ideas Bank/All Our Stories Celebration meeting at Ickworth House was reported in the Eastern Daily Press – a really good feature written by Mark Nicholls. See below for links to the report. 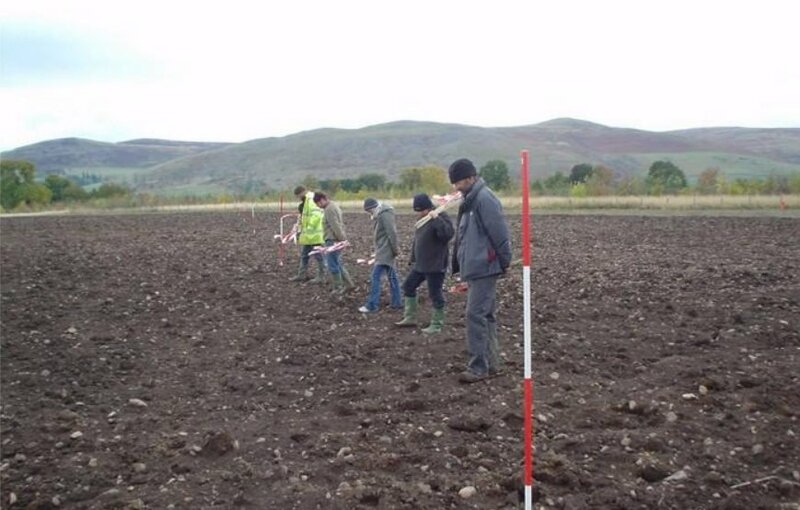 Dear All – it is with regret that I have to inform you that the archaeologists think the field is too wet and too heavy to walk on Thursday and Saturday. As the project does not have to be completed until end of March we might be able to squeeze a session in the spring, weather permitting. We will post information on the website in the New Year if this is to go ahead. Very sorry – and very disappointed. 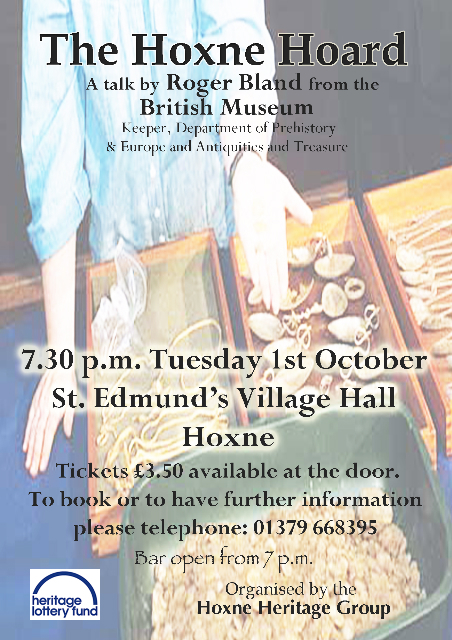 Last Tuesday about 80 people attended the very interesting talk on the Hoxne Hoard by Roger Bland of the British Museum. 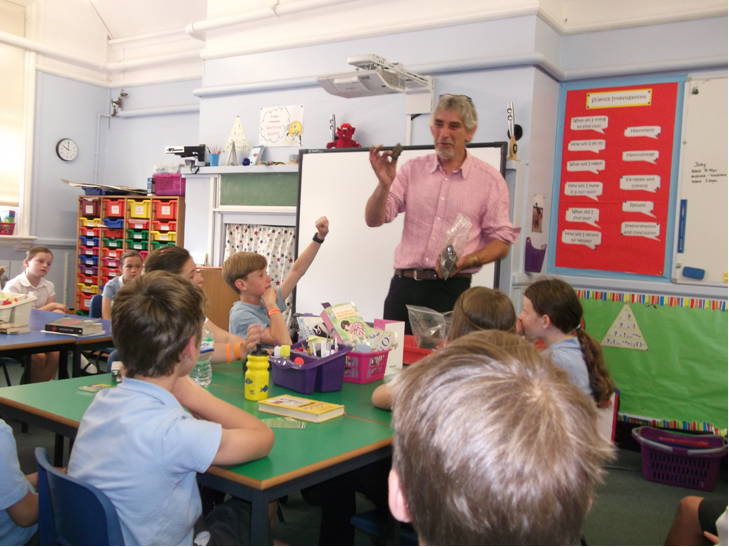 This morning (Wednesday, July 17th) Duncan Allan, outreach officer from Suffolk County Council Archaeology Service, returned to St.Edmund’s primary school in Hoxne to discuss the artefacts found when they excavated a couple of test pits on the green in May. 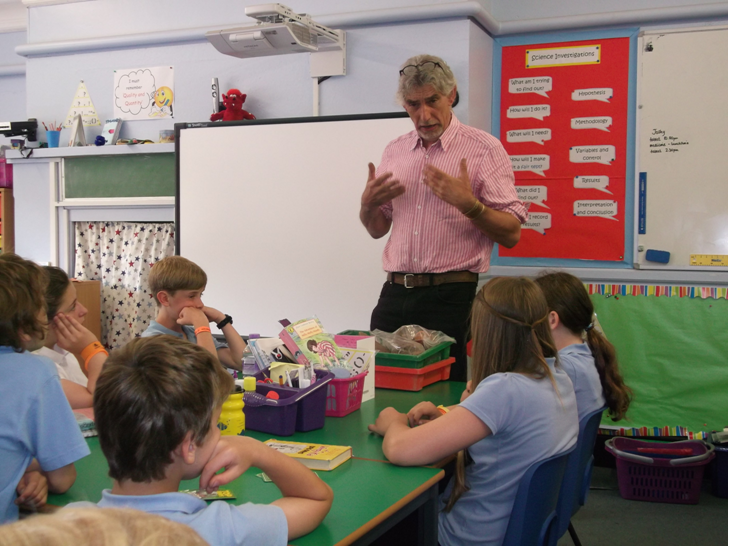 He encouraged the children to think how the lives of the people who lived here many years ago differed from life in the village today. 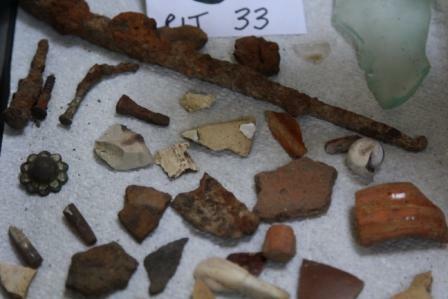 He focused particularly on children in the past through objects that were found in the dig, namely a slate pencil, a marble and the heel iron of a small boot. The children were totally engaged in the exercise and really enthusiastic in their participation. 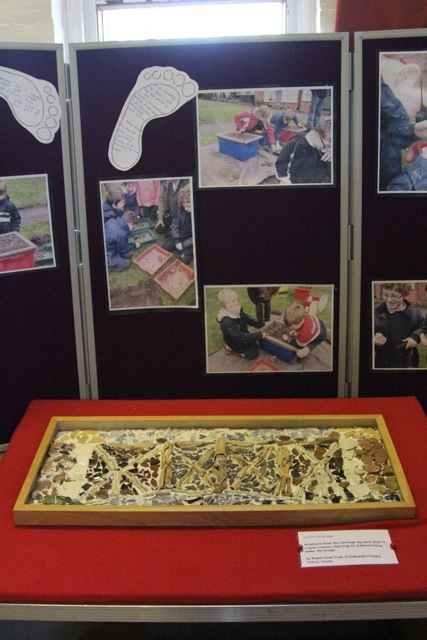 Some children spoke very animatedly about their later experience of taking part in the main dig last week.